Mail Merge in Gmail allow you to send personalized messages to multiple people in one go. Individual message will have same content but you can customize some part of message. For example you can change the name and postal address or person and still message stay same in text body. Mail merge option available in premium and free editions. You can purchase this service by making payment through credit cards and debit cards or Paypal. 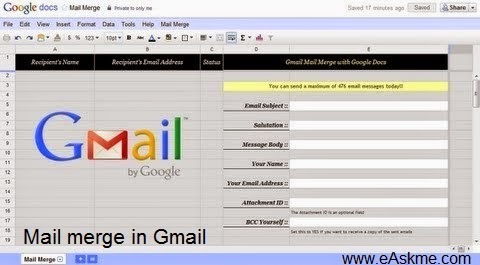 Mail Merge in Gmail allow you to send richtext emails to multiple contacts same time. Click Here to create mail Merge in Google Drive. Mail Merge iinternally use Google Apps Script. Go go "Mail Merge", Click on the "Reset" to clear canvas and authorize sheet to access Gmail and Google contacts. In Google Contacts, create new group with contacts on those you wish to send personalize email or you have to enter names and email addresses manually in Google sheet. Under Mail Merge menu, select Import Google Contacts and choose Google Contact group you have made. Ths will import all contacts of that group. Fill fields of email template. Compose an email template using HTML mail tool and copy the code and paste it into message body of Google Sheet. You can also upload any file in Google Docs that you want to send and copy the Id and paste it in aattachment ID field. ID will show in URL. Go to Mail Merge and click on "Start Mail Merge". Statues will change to "Ok" for those emails that are successfully delivered. You can daily send maximum number of 100 messages., as it is the limit of Gmail. You can also send Personalized Emails using Mail Merge in Gmail. Do share your own tips about "Google Plus".